I had him in my database a Henry Stearns for a long time. He was my great-grandmother’s grandfather and my information ended with him. After my paternal grandmother passed away, we found some old documents in her boxes of old family stuff. One such document was an old German booklet. 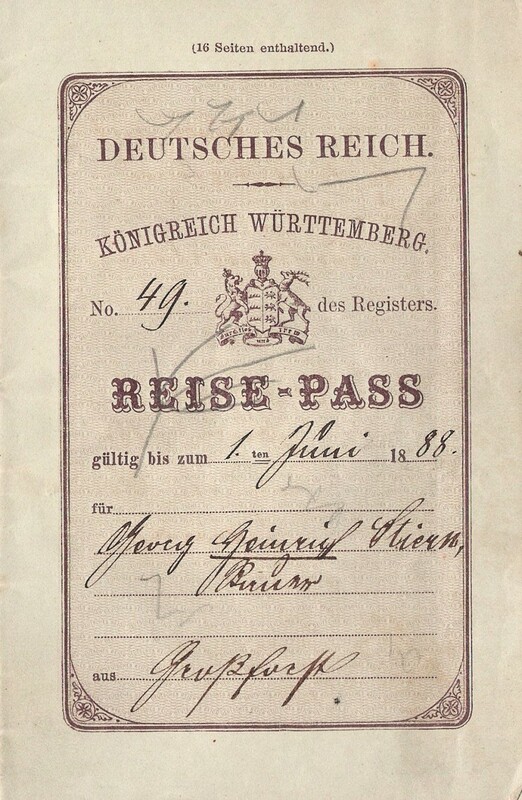 It turns out that this was Henry’s passport from when his family left Germany and came to the US in 1888. You can see the title page from the document at the right. It turns out his full name is Georg Heinrich Steirn. On another page in the booklet, it lists his current family members, including his wife Katherina SCHUMACHER. With this information, I was able to track his family down using some of FamilySearch’s German baptism and marriage records. 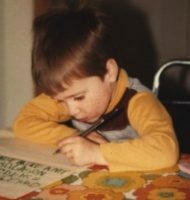 So, now I have names a few generations back from both Henry and his wife back into the Baden-Württemberg area of Germany. Henry passed away on 28 July 1900 somewhere is Wisconsin, most likely Waupaca County where he is noted to be buried at Oakwood Cemetery. This post is 22 of 52 in the “52 Ancestors in 52 Weeks” Challenge” begun by Amy Johnson Crow.